ure their operations contribute to a more sustainable future with nurses having the opportunity to lead the charge in making schools more environmentally friendly. Incorporate climate change and health into both undergraduate and graduate nursing or health curriculum. Nurses can engage in research that evaluates such topics as the health impacts of climate change, strategies to mitigate or promote climate resilience, and climate impacts on vulnerable populations. Implement initiatives that work to reduce the carbon footprintof universities. Host university workshops, conferences, or events with the theme of climate change and health. Work with university leadership to make a statement in support of action on climate change and health. Collaborate with other health professional schools in areas of education, research, and public policy changes. Health Students for a Healthy Climate co-founded by Shanda Demorest was formed at the University of Minnesota Academic Health Center as a way to engage health students on climate change and health. The aim of the group is to develop interprofe ssional student partnerships around climate change. The group hosts events at the Academic Health Center throughout the semester to educate students on the health impacts of climate change and how they can take action as health professionals. Robyn Gilden and Karin Russ, both nurses and professors at the University of Maryland School of Nursing have formed a Climate Change Work Group at UMSON that recommends ways to improve school curriculum so that graduates have a better understanding of climate change and health, along with making recommendations for initiatives that the school can participate in to reduce the carbon footprint of the building. 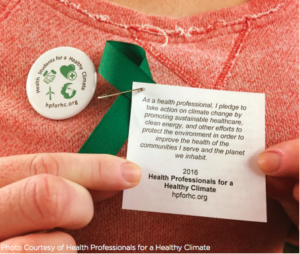 Health Professionals for a Healthy Climate co-founded by Teddie Potter has developed interprofessional climate change curriculum for the six health professional schools in the Academic Health Center at the University of Minnesota. Nurses See “The Big Picture”: Addressing Climate Change as a Social Determinant of Global Health, a journal article by nurses on the importance of climate change in curriculum. NurSusTOOLKIT is a European funded project that has developed an evidence-based sustainability literacy and competency framework for nursing. 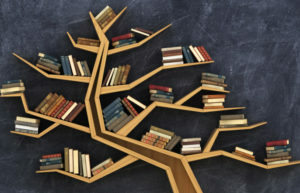 This underpins significant educational materials to include in nursing curriculum to educate students on sustainability initiatives to address climate change. More than 50 topics are available, many in different languages: English, Spanish, Dutch, German, and French, more languages are planned. Nursing Sustainability by Design: Video with scenarios to teach nurses and healthcare students about climate change and sustainability.